Among the countless contradictions that comprise the phenomenon called “Japan” there isn’t perhaps a bigger (and better hidden in plain sight) one than the green tea that has so much identified with the land that the Japanese usually call it “Nihon-cha” (日本茶), i.e. “Japanese tea”. It can be found in all vending machines, cold in the summer and hot in the winter but it is absent from the menus of the various cafés; it is offered for free in many restaurants and it is a flavor choice in countless deserts and ice creams but it can seldom be ordered in the “kissaten” (喫茶店), the “teahouses” that abound in every Japanese city. 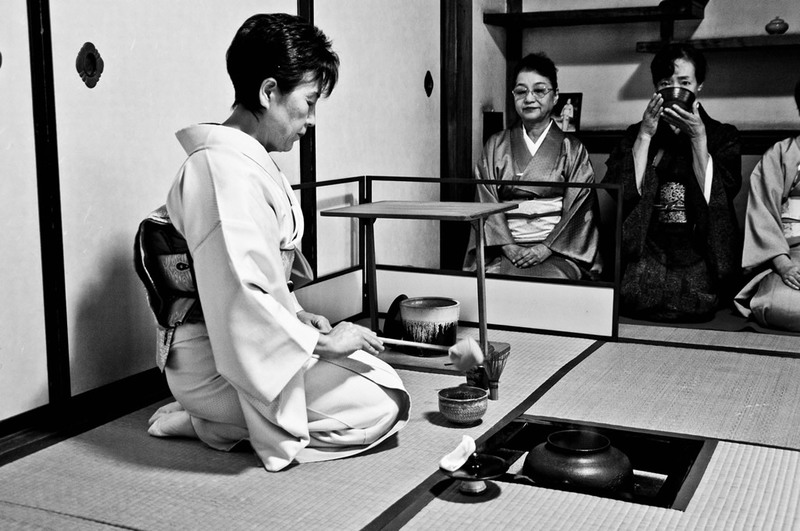 As for the famous “tea ceremony”, “sado” (茶道), everyone knows what it is but relatively few can perform it and many have seen it in its full extent only on TV. It seems odd but this omnipresence of tea for twelve centuries is the reason it is rarely served in the cafés: for the Japanese, tea is something like water, something which doesn’t make sense to order and pay for the same way you do for a coffee or a refreshment drink. It is something that the family of a departed will offer as a gratitude gift to the friends and acquaintances attending their funeral, something that a company will always have stocked for guests and customers; something that simply is. The proliferation of vending machines in the 80s brought with it the idea of cold bottled tea for sale but many Japanese doubted the idea would catch –of course it isn’t strange that it did: machines plus tea is an almost certain recipe for success in Japan. Every culture has its taste, a taste that invariably encompasses many things, edible and potable. And although some Japanese complain that tea isn’t as practical as coffee (a good cup of tea demands for preparation in very small quantities and constant changing of the leaves), I doubt that they could imagine the taste of their country without it; even the bowls of rice, Japan’s staple food are called “chawan” (茶碗), “tea bowls”. Perhaps this is the reason why the tea ceremony, highpoint and custodian of the classical imperial aesthetics of Kyoto and at the same time pinnacle of the, often to the extent of missing the substance, formality that characterizes the Japanese remains relevant or that the ulteriorly motivated “Book of Tea” by Okakura Tenshin is still a best-seller, a century after its publication: when you love something that much, it’s inevitable to build a culture around it.